I first reviewed THE FALLS back in November but George Jackson has come out with another installment, THE FALLS: Thanksgiving so I am very pleased to have him here with us again today. George spent 40 years in education as a teacher (11 years) and a principal (29 years) in both Vermont and New Mexico. 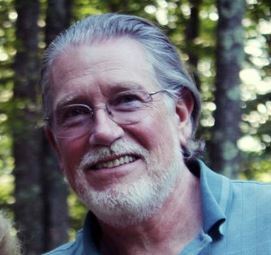 He and his wife Carolyn, who taught for 30 years, have five children, eight grandchildren and three great grandchildren in their combined family. He is also an artist in oils and loves reading, video games, fishing and the ocean. George and his wife now live in Tradition, Florida. Besides THE FALLS series he writes dragonrider fantasies and humorous short stories about kids and schools. He has even written a children’s book, The Twilight Tea Party, also at the Kindle store. Today George is going to tell you about is life as a storyteller. Welcome, George. First, I must say that it’s a real pleasure to be back here with Kate Eileen Shannon once again. I truly appreciate her never-ending expertise, wide ranging skills and friendship. This Irish Colleen has pointed this old Scotsman in the right direction more times than I can count. My humble thanks, Kate, always. I’ve been a storyteller ever since I was seven or eight. My head has always had so many thoughts, ideas and worlds and my imagination has always asked the age-old wonderings: What if Why not? and tried to fit them magnificently into so countless Once upon a times. When I was a kid, hiding away upstairs in my room, I would draw courageous heroes and beautiful, brave heroines, powerful dragons and unspeakable monsters, and then create stories where they would fight great battles, solve unsolvable puzzles and then all live happily ever after. Well, perhaps not the monsters. But I hid my stories away, rather self-conscious and embarrassed to share them with my family or friends. Not because I would have been laughed at, but because I truly wasn’t ready to share them yet. My father, bless him, made me a tree swing in our backyard. The rope went up so far into the tree that I swore at times it was like Jack’s magic beanstalk… you couldn’t see the top because of the clouds. Every day I would go out and swing as high as I could, glancing out eagerly (and with just a bit of tantalizing fright) over the top of our roof, feeling the warmth of the sun and the wind whistling around me and I would imagine soaring on dragon back out across the skies of some vast dessert. At night, when I went outside and watched the lights from the fireflies rushing randomly to and fro in the velvet darkness, I would create tales of the dark that scared the living dickens right out of me. Their flashing lights would become the eyes of terrifying creatures and the darkness would become filled with the night sounds of rural Vermont. Owls hooted softly, dragonflies and insects buzzed, a dog barked a mile away and a lonely hungry howl would make me shiver. Then I would creep back toward the warm lights from our house and safely envision a realm of creatures of the night as I peered out wide-eyed into the gloom. When I was a teenager, I began writing those stories down as short stories. I happened to be a quiet kid, so I still didn’t share them. Those stories were special to me. They were mine and I was very protective of them. I wrote and rewrote those stories on yellow pads in pencil so I could back and correct them. As I got older, I began to type them up on an old manual typewriter, frustrating myself over and over again, my fingers almost permanently stained from black typewriter ribbon and the delightful, and ill-advised erasing solutions of the day. But I was still a storyteller, more than ever. The stories were now on paper as well as in my thoughts and mind, that’s all. So I typed and wrote and created worlds, fought titanic battles, soared on dragons and lived happily ever after. I would write hunched over by flashlight in my bed at night when my parents thought I was asleep. I would write when I was supposed to be doing homework. I would skip breakfast and write. At school, when Mr. McGinty’s English Literature class became particularly boring, I would secretly write stories in my notebook, at least until the other kids around me began wondering what I was doing and tried to catch a glimpse. Then I would hastily shut my notebook, zip it tight and sit listening to McGinty’s boring lecture, my face redder than a baby’s bare bottom after three hours on the beach in August. As I moved on to the hallowed halls of university, I continued to write. By now I had boxes filled with stories that no one but I had ever seen or read. Most of my stories back then dabbled in horror, suspense and fantasy. I tentatively sent a few stories here and there out to publishers and magazines. At times I would receive a written note telling me that my stories were good, just needed more polish or that they just didn’t have a place for them at the moment. Some editors actually took the time to tell me what they liked and what I needed to improve upon. I treasured those letters. I would keep them and read them over and over again, taking every word to heart. And when I felt the lowest, convinced that my humble stories would never find the light of day, never have readers to enjoy them, I would take those letters out and reread them over once again. Life happened. Two marriages, five children, eight grandkids and three greatgrandkids magically appeared and blossomed. Forty years in education in Vermont and New Mexico went by, twenty-nine as a principal. My days were filled with solving problems, making my staff and the kids’ parents feel good about themselves and what they were doing with kids, cheering students on and being “Dad” to thousands of kids and adults. I worked twelve hours a day and spent as much time as possible after that with my family. Even then, I would write Dragonrider fantasy novels late at night. I was so tired that at times I would nod off sitting up typing into the computer. But I still wrote. I truly believe that the dragon rider fantasies allowed me to shuck off the cares and issues of each day at school and permitted my imagination to soar free and unfettered, once again on dragon back. Now, I am retired. I write small town mysteries (The Falls small town mystery series) and Dragonrider fantasies (the Dragon World series). I have finally sent my stories out into the world, by self-publishing them through KDP on Amazon. I am delighted to finally be sharing those worlds, those dreams and visions with others. After publishing twenty-one of my books on Amazon in the past three years, however, I am still, at heart, a storyteller. I weave stories, pure and simple. I hope that you get a chance to read some them. It would make this old Scottish heart smile. 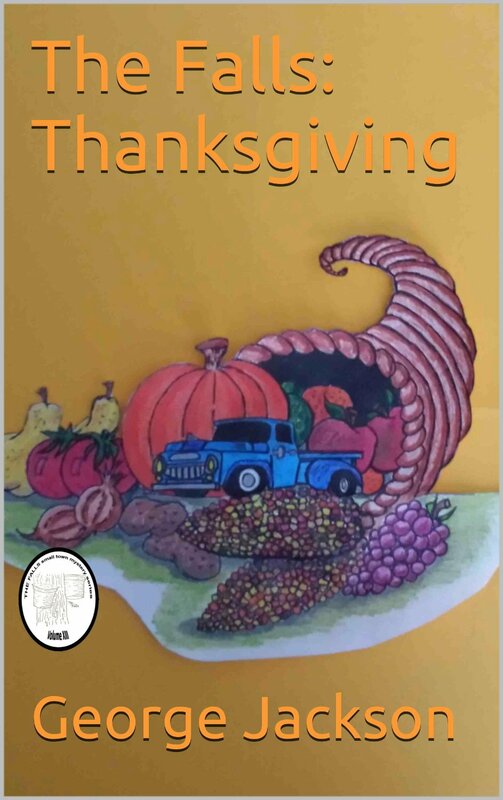 (The 13th volume in The Falls small town mystery series) Thanksgiving is a time for sharing time, laughter and good cheer with family and friends. Especially in small towns. But this Thanksgiving, there are some special reasons for the community to give thanks. An early morning accident and a terrible hidden family secret weave a plot that has several intriguing twists and turns. All the while Jordan Smith Stone works on creating the ultimate Thanksgiving dinner and celebration! Join Sheriff Cash Green, Deputy Ericka Yamato, Deputy Horace Scofield along with Doc Stone and Dr. Meg Monroe as the colorful characters in The Falls once more weave their small town magic! Set in Vermont, it’s a very special Thanksgiving…so return to The Falls! I am a big fan of George. He and his writing always make me smile.